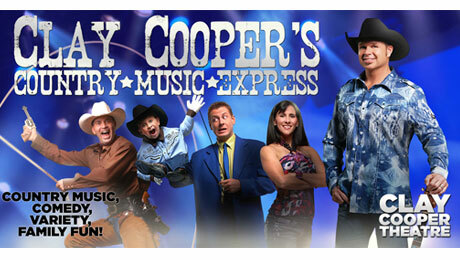 Clay Cooper’s Country Music Express is one of the most fantastic Branson shows to perform at the Clay Cooper Theatre located at 3216 West 76 Country Blvd in Branson, Missouri. In this show, you will see Clay Cooper and his Live Band, 10 Dancers, New Male Trio of Singers, and Comedian Matt Gumm. Also featuring in this show are outstanding youth entertainers Colton & Caden Cooper. This high energy show is filled with singing, dancing, comedy, 24 entertainers on stage, great visual effects, and a variety of music – old & new country, current hits, rock, gospel, and patriotic. You don’t want to miss this show – it’s more than just country. Clay Cooper’s Country Express is one of the most popular country variety shows in Branson that delivers a high-energy, action-filled, two hours of entertainment that everyone in the audience surely enjoys. Clay Cooper has been performing in Branson for more than two decades now. He has performed with some of the biggest shows that come through the area and has been a crowd favorite in every show that he has had the chance to be a part of. Whether he’s entertaining audiences with his amazing voice or making them laugh, his talent and extremely likeable personality is truly unmatched. A versatile musician, Clay Cooper has been performing in Branson since the young age of 16 and now has his own show. There are many Branson shows that offer variety and diverse talent but not as entertaining as Clay Cooper’s Country Express. Cooper’s love for country music, clean comedy, and human interaction, has made him a star on the Branson entertainment circuit. While the music and singing style of Clay Cooper take the spotlight, he is joined by more than a dozen phenomenally-talented entertainers who help share some of the magic you will witness over the course of the two-hour show. Music fans will find the show to be one of the best shows in Branson as it features samples and highlights from many different styles of music including classic & modern country hits, inspirational gospel songs, and maybe some rock ‘n roll weaved into various segments. Additionally, Clay Cooper’s tribute to the Veterans who served our country provides an endearing gesture from one of the most talented performers you have ever seen. The energetic singers and dancers help provide a backdrop throughout the show, highlighting some of the outstanding local talent in Branson. In addition to the singers and dancers, trick rope virtuoso and expert Johnny Lonestar will amaze everyone in the audience with his rope tricks while comedian Matt Gumm will have you laughing out loud. Whether you’re visiting Branson with friends or family, there is no denying about the appeal of the show – a perfect match of many different types of entertainment. Clay Cooper's Country Music Express is a fantastic Branson show that features a variety of music – old & new country, rock, current hits, gospel, and patriotic.